Scientists at HPCAT have observed a unique type of high-pressure phase transition in vanadium that has not yet been documented for a pure element. At about 60 GPa, single crystal vanadium undergoes a cubic-to-rhomohedral transition in which the volume does not change at the transition. The displacive phase transformation is quite similar in nature to that observed in FeO at high pressure, where the paramagnetic-antiferromagnetic transition drives the second-order structural change. Theoretical work carried out by scientists from Uppsala University indicates that vanadium will show increased electronic and magnetic interactions at high pressure that would drive such a transition, this time in a pure element, without the benefit of matal-oxygen-metal contacts to mediate the magnetic interactions. In the case of vanadium, the electronic and magnetic interactions will be much more subtle in nature. 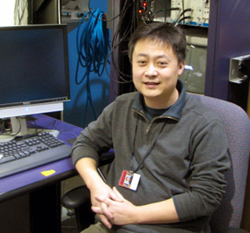 Working at the HPCAT's microdiffraction beamline 16-ID-B, Yang Ding and co-workers used diamond anvil cell techniques to compress a single crystal of vanadium metal to 155 GPa. Above 65 GPa, the  and  diffraction peaks split, as illustrated in Figure 1, indicating a transition from the bcc structure to a rhombohedrally strained variant, while the  peak does not undergo a similar splitting. The absence of splitting in the  peak confirms that the volume is conserved across the second-order transition. 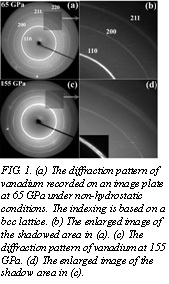 Figure 2 shows the non-hydrostatic x-ray diffraction patterns of vanadium at (a) 65 GPa, (b) 90 GPa and (c) 155 GPa. The work appears in the February 23 issue of Physical Review Letters.